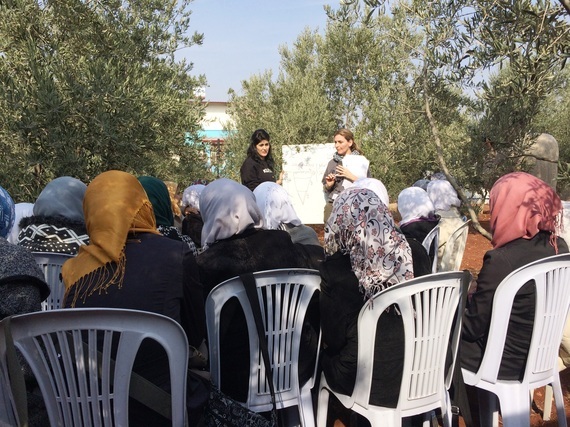 We sit in the garden of the Salam school in the city of Reyhanli, at the Turkey-Syria border. The wind ruffles the olive trees, and from the corner of my eye I see the school's pet ducks and rabbits basking in the afternoon sun. This is the setting of Karam's journalism class. Twenty-two girls, all in headscarves, sit on plastic chairs arranged in a semi-circle around a whiteboard and two Karam mentors. Both mentors are accomplished journalists. Both are Syrians who, like their students, do not know when, if ever, they can return home. 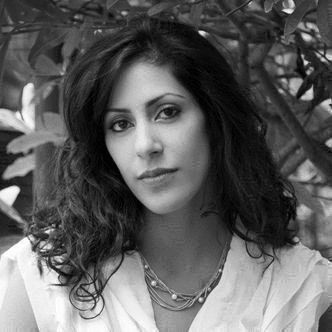 Hala Droubi, a pretty young woman with blonde streaks in her hair, is a former New York Times reporter with a Masters in journalism from Columbia. She asks the students what they learned in yesterday's class about the five questions each news piece should cover. Hala's teaching partner, a correspondent for the Arabic television station "The Orient" named Kinda Kawas, writes the answers on the whiteboard. Her eyes blinking in the bright sun, she writes "Why; Who; Why; Where; How." Three boys begin chasing one of the rabbits as Hala and Kinda move on to discussing the significance of objectivity in reporting. They proceed to teach their students that their credibility as would-be journalists hinges on their neutrality. "Even if you are covering the revolution," says Kinda, pulling back her striking dark hair. - Karam's journalism workshop at the Salam school in Reyhanli, Turkey. Hala adds, "Or if you're writing about someone killed for the revolution, you may not say they were 'martyred.' You must use the word 'killed.'" Her voice is tender. Mindful that every girl sitting before her is a traumatized war victim who has buried her father, seen her brother amputated, or wrapped her baby sister in a blanket and carried her for hours on end across the border ... for the very revolution she is being taught to treat with emotional non-involvement. If only these instructors could set up an objectivity workshop for some of the mass media in the United States, it would change the world. To my right, I see the boys have given up on catching that rabbit. He is just too fast. The ducks seem undisturbed by the commotion. The speed of rabbits in this region has inspired one of the greatest stories of humanitarian triumph I have ever heard. A suburb of the Syrian capital Damascus, the city of Douma, has been besieged by the Syrian army for more than a year. Not only are the citizens subjected to constant shelling, but the Syrian army has blockaded the city, preventing not only anyone from leaving but also the entry of all humanitarian aid. Warlords and armed groups have taken control of supply stores. Douma's men, women and children are being intentionally starved to death as the battle for their city rages on. As Syrians tell the story, a few months ago aid workers devised an ingenious plan to unleash hundreds of rabbits into Douma. They believed that the rabbits would hop and dart their way past the soldiers, make their way into town, and serve as a source of food. Those rabbits not immediately consumed could even breed. I could not find independent written verification for this story, but multiple Syrians swear to its veracity and further insist that the plan actually worked. Indeed, the people of Douma are managing, somehow, to survive. Back at the Salam school, it is the morning after Hala and Kinda's objectivity lesson. The school is filled with that morning's elementary school-aged children. 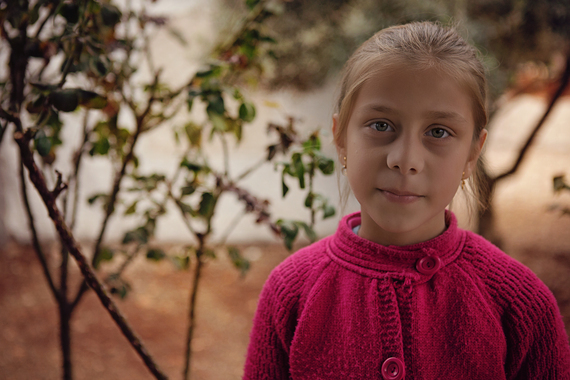 Hala talks with Rahaf, a nine-year-old blonde with a pink button-down sweater. Hala asks Rahaf what she cherishes most in life. "I love ducks," Rahaf says, tears gathering in her green eyes over the idea of people eating her beloved ducks. "I want to save them all!" To Rahaf, eating cute animals is a tragedy. She, who is yet too young to process the carnage of war, does not fully grasp the horrors of a people so starved that they resort to eating fluffy creatures. In a few years, Rahaf's mind will grasp not only the full landscape of the terror that now surrounds her, but also the depths of her people's courage and resiliency. Just as the minds of the teens who attend Karam's journalism workshop thus understand. The very teens to whom Hala and Kinda preach neutrality. To describe the task ahead of them all as "challenging" could not be a greater understatement. Yet, their class moves on to its next session. And every seat is full. Many thanks for your "likes," shares, tweets, and thoughtful commentary. Dynamic and respectful conversation is welcomed and appreciated. Shermin Kruse is the author of Butterfly Stitching. Lawyer, activist, artist, photographer and mother of four who recently published her first book, "Butterfly Stitching."